The third part of our survey results will focus on opportunities to make workshops and shows more satisfying for attendees. NOTE: With 107 responses, this survey is not a statistically significant profile of the community's needs. However, especially where the response is substantial (i.e., where the numbers are big), the results should provide direction for decisions in planning your offerings and communications to this market. We all know that putting on a workshop takes a lot of time, a lot of energy, and typically a significant financial investment. To help event producers deliver workshops that delight their attendees and make them want to sign up for the next event, we simply asked what factors have made recent workshops less than satisfying. Not surprisingly, most respondents who were disappointed with a recent workshop found it less than relevant or simply not a good value. 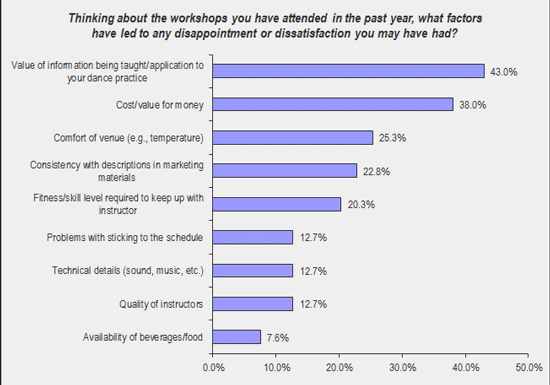 However, the next several responses are interesting... a quarter of respondents had issues with uncomfortable venues, and almost as many found that the workshop they attended was not the same as the workshop they were expecting based on the marketing materials. A significant percentage also felt that the workshop required a degree of physical stamina that they do not possess. "I'm sick of choreography workshops. More advanced technique is needed." "I've either had amazing luck, or made very wise workshop decisions this past year! I was only disappointed once, and it was because the workshop was just too far out of my skill set. It was a different style than the one I dance, and although it was billed as 'for all levels,' it was quite advanced from the get-go. I just couldn't keep up. That was one workshop out of 20+, though. The others were all great." "I do not like attending festivals with two hours of Instructor A, then three hours of Instructor B. I would rather see a longer time frame or an intensive with one instructor." "Same studio same instructors teaching same stuff with a twist on themes." "I am frustrated with beginners taking master-level workshops. This dumbs down the workshop for everybody." "When I do choreography workshops, I often feel a DVD is much more valuable. I require repetition to learn combinations and find that I walk away from a choreo workshop with very little. I am grateful to instructors who allow video of the choreography or who hand out notes." "Some of us specifically take workshops based on topic/curriculum offered. On rare occasions after clearing my schedule and looking forward to a certain topic taught by a certain instructor, at the last minute they decide to teach something entirely different. This is greatly frustrating." "The workshops not actually matching the description or workshops that were overbooked for the space." "A performer was booked locally and the sell was her style and fluidity. When the three-day workshop occurred, none of that was covered. I was very disappointed for the amount of money spent. I do not go to dance events by that producer as a result - music, yes." "Some workshop descriptions are quite over-inflated about what they will be teaching and lack information about the skill level required. Rarely, can I find an advanced level workshop class because the participants are all over the map with skill. The instructor is then reduced to reviewing basic technique for those who cannot keep up." "Instructors need to be more fluent in English, otherwise hard to understand." "Teaching experience and instructor not being able to explain what she is doing physically or musically. Watch and follow...it's up to the student to figure it out." "Lack of attendance from students, teacher, groups, etc. when the subject matter is obviously geared toward them. 'Rumors' that workshops/events were poo-pooed by others rather than encouraged." "Too many attendees for space available." Respondents who have had less-than-stellar experiences watching shows or performances were asked to indicate why they were disappointed. I was slightly surprised to see that over half of respondents have been disappointed at the quality of seating and the ability to see the performers. Finding a good, affordable venue can be a challenge, but producers should carefully consider whether their ticket purchasers will be able to clearly see the stage, and whether every attendee is getting a fair shot at enjoying the performances. (Some of the verbatim comments below imply that restaurants venues are often the cause of this problem.) 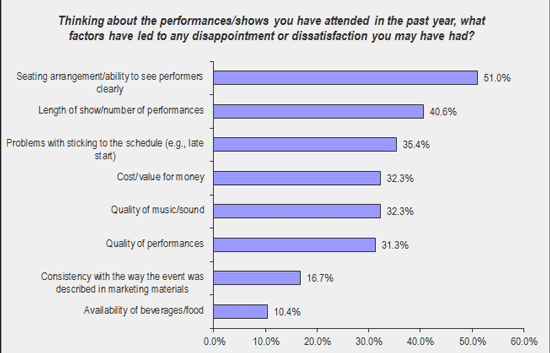 Respondents also noted that shows are sometimes too long, with too many performances. About a third of respondents were also dissatisfied with the quality of the music or sound -- or of the performers in general. "Overall, most of the shows have been too long and too bloated with performances. I know it's hard to turn potential acts down, but if you MUST have everyone you know perform, please shorten set lengths and keep everyone to one set only." "Shows with over 25 performances are simply too long. Combine that with lengthy MC introductions, and it's almost unbearable. Put the info in the program and leave out the chatter. And please, please no curtain call where the dancers are called up one by one. The music should never be an issue and when it is, the show feels completely unprofessional." "One distant event two hours travel time. Started one and a half hours late, had over 20 performers uhggg. Some were the same performers with multiple numbers double uhggg." "Only booking performers who were friends so it ends up being the same show over and over again, or not labeling a show correctly (i.e. student performance recital labeled as a professional bellydance event.)" "I know a lot of people invite their friends to perform but when the lineup for a show if the same for three years in a row it's time to shake things up." "If events are sponsored frequently by the same sponsor, do not put the same dancer in the same lineup spot all the time (i.e., in the beginning as it does tend to sometimes make that dancer feel like she's being viewed as inadequate). This is only when it's the same all the time." "Repeat of performances that are several, several years old. Performances that technically do not require one to take a bellydance class." "If you're going to charge everyone the same price for tickets, you cannot reserve the best seats for family and friends. If your marketing material says, 'doors open at 6:00,' I should not show up at 5:50 and find the venue packed and no decent seats." "I went to a show with wonderful dancers that had horribly distracting lights. Keep them bright and the color constant -- I want to see the dancers, not the DJ's technology." "Lack of organization and front end planning has been a huge issue. Poor communication from event planner. Sometime instructions are not always clear and questions are asked. I hate it when people ask questions and they get responses that don't address the question." "Overall poor organization. Lack of clear information for the performers. I should not have to case an organizer to find out what time as a performer I need to be there by."